Swirl, sniff, slurp meets puff, puff, pass when Vail Village’s Root & Flower wine bar teams up with Eagle-Vail’s High Country Healing dispensary. Long are the days of back alley toke-sessions that you scored from a friend of a friend paired with pints of Coors; this is Vail, after all, and although the town itself hasn't warmed to the idea of allowing recreational pot shops anywhere near the village areas of Vail and Lionshead, there are ways to get a higher perspective on the finer side of Colorado's signature vice. For anyone that has a private spot to light up (it's still illegal to smoke in public and in most hotels), the crew at Vail Village's Root & Flower teamed up with Eagle-Vail's award-winning dispensary High Country Healing for a custom menu that pairs the flavors and effects of the cannabis shop's selection of bud with a sommelier's perspective on accompanying wines, beers, and spirits. While the dispensary can't serve Root & Flower's recommendations (and vice versa), the collaborative menus are available for customers at either business to pick up for a do-it-yourself indulgence from the comforts of home. So, how did Vail Village's go-to wine spot end up creating high-end pairings to go along with High County Healing's seasonal selection? "We're like-minded in a lot of ways," says High County Healing's Chief Operational Officer Andrew Salini. 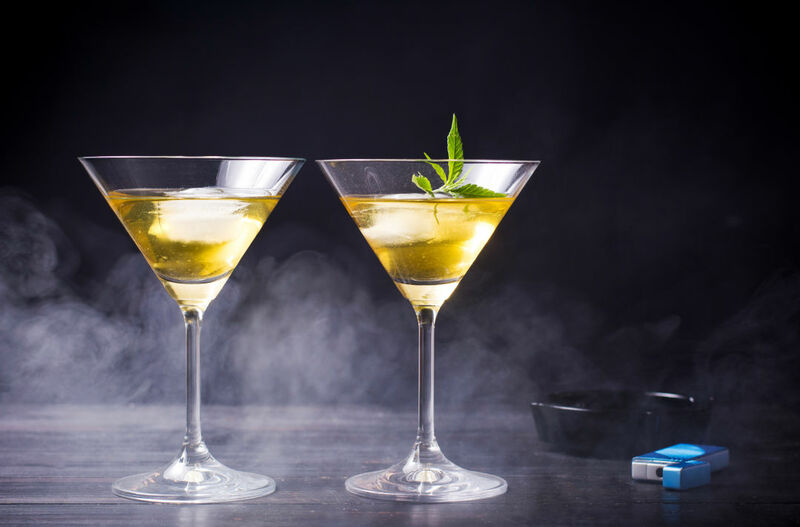 "How we approach cannabis and how Root & Flower approaches wine and spirits is pretty similar." An educated consumer base that has expanded along with the industry has added to that approach, as well, as many of the customers who filter into HCH's show/grow room in Eagle-Vail often know a bit about the product and are looking for a specific taste, flavor, and a effect rather than a more generic buzz. Much like wine enthusiasts, patrons of the Eagle-Vail dispensary are often concerned with things like soil, growing conditions, and varietal, making pairings like the Summit Sweet Skunk (a light Sativa) with an American IPA more of a thought out indulgence as opposed to a stony synchronism. 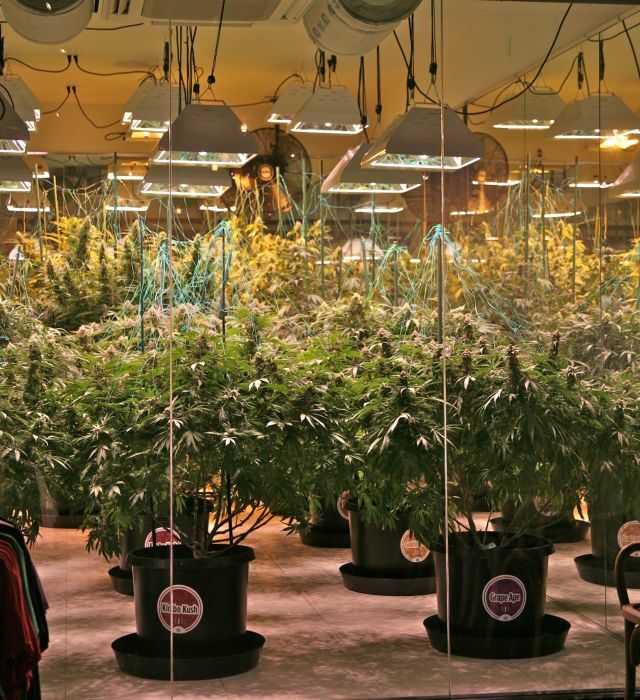 The grow room on display at High Country Healing. In order to compile a menu that paired strains and sippers, Root & Flower's sommeliers put their certified sense of smell to work (along with their imaginations) to match the aromatics of each varietal to its drinkable companion. "That was a really fun day," says Salini. "They [Root & Flower] had the whole team come in, and all the sommeliers were smelling our plants, taking notes, and talking about potential pairings for each strain." Salini says that the resulting menu helps create a better experience for both wine and weed connoisseurs, along with creating an experience that raises the bar for the industry. "So far, people have been pretty excited when they see the menus," he explains. "It just shows that on both the operational and consumer side we're moving in the right direction, and that the more we know about this plant, the better we can make recommendations for each individual." The two businesses have plans to collaborate again on a winter menu featuring more seasonal beverages and buds, with locals able to preorder strains from High Country Healing's seasonal harvest, too.